UC and Cloud Day and the Microsoft Cloud User Group are run by volunteers for the benefit of the wider IT pro community and are not-for-profit events. To make sure the money donated in sponsorship is only used for the community, a Community Interest Company (CIC) was formed. CICs are governed by criteria similar to charitable organisations and have rules and regulations in place regarding spending. All Directors take on this burden of trust and responsibilities when they are appointed. A number of the original organisers were made Directors of the CIC, including Andrew Price when it was first formed. Sadly, late last year, it transpired that a significant sum of money had been removed from the account by Andrew Price for personal use and that false figures had been provided to the other directors and filed with HMRC and Companies House. Once the removal of funds was discovered, the other Directors of the CIC acted quickly to protect the Company and remaining funds. 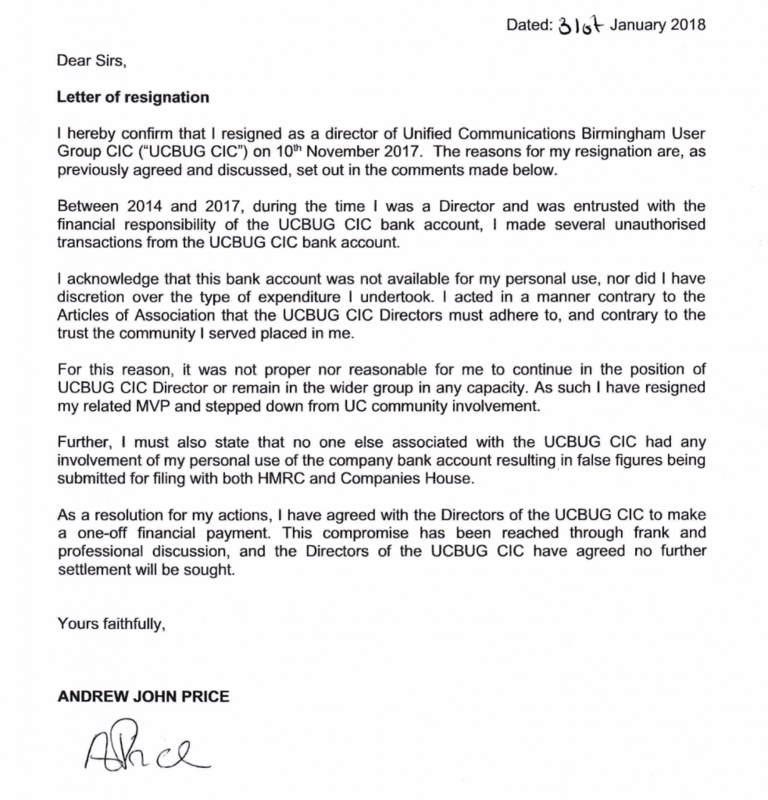 This included seeking both legal and regulatory advice, the culmination of which sees the CIC entering into a legal agreement with Andrew Price to secure the return of funds in a timely manner. Further to the repayment of the money, Andrew has resigned as an MVP and to ensure that this does not happen again to other people organising or supporting community events Andrew has agreed not to be involved in running community activities for a period of three years.